Rick really wanted to see the Goring Hotel -- this is one that holds a warrant to the Queen and the spot where Kate Middleton and her family stayed the night before the Royal Wedding. So we took the tube to Victoria station and en route stopped by Buckingham Palace. The Queen was in residence, we noted, by the flying of the Royal Standard. And alas, no guard to change. We'd seen that before but it's always fun. Only a guard walking about. But then we heard sounds from down the way and soon a parade of sorts. It wasn't a long parade... now you see it, now you don't! But it was followed by the Royal Pooper Scooper. Certainly a nice touch, especially for the tourists! And shortly after that a carriage drove through the gates. We weren't sure who they were (no one turned about or waved) but we later learned they were either from Malta or Bulgaria. Both attended the palace that day, according to the Court Circular. "His Excellency Mr. Joseph Cole was received in audience by The Queen today and presented the Letters of Recall of his predecessor and his own Letters of Commission as High Commissioner for the Republic of Malta in London. Her Excellency Mrs. Jacqueline Zaba Nikiema was received in audience by Her Majesty and presented the Letters of Recall of her predecessor and her own Letters of Credence as Ambassador from Burkina Faso to the Court of St. James's."... The President of the Republic of Bulgaria and Mrs. Radeva visited The Queen this afternoon. The Queen and The Duke of Edinburgh were represented by the Lord Taylor of Holbeach (formerly Lord in Waiting to The Queen) at the Service of Thanksgiving for the Life and Work of the Baroness Jowell (formerly Secretary of State for Culture, Media and Sport) which was held in Southwark Cathedral this morning. The Prince of Wales was represented by the Earl of Rosslyn. The Duke of York was represented by Sir Andrew Cahn. The Princess Royal was represented by the Lord Coe. Princess Alexandra, the Hon. Lady Ogilvy was represented by Mrs. Peter Afia." It was a short walk to the Goring from there. We contemplated visiting the Royal Mews but settled for the gift shop instead. It was a lovely walk, perfect sunny day. It's an impressive hotel, located a few blocks from the Palace. I have to say I loved their flowers. And no one could say they didn't have their British spirit on display. The Royal Warrant was on display, too. Then we went back past the palace and had a lovely walk through Green Park. Which was really more yellow on this October day. It was time for a foot break (pun not intended, since it wasn't actually broken!) and we enjoyed watching people in the park. I've said it before and will again -- the Brits are wonderful with their green space, which certainly makes massive cities much more inviting -- especially for those who aren't able to drive out to the country so easily! We hopped the tube and headed to Sir John Soane's House. This is one of those little gems that you sometimes see in guidebooks, but I don't think it gets the press it deserves. They didn't allow pictures within so these are from my postcards or sourced from wikipedia. In 1792, Soane, an architect who built the Bank of England and was responsible for modifications to the House of Lords at the Palace of Westminster, along with many other known buildings. 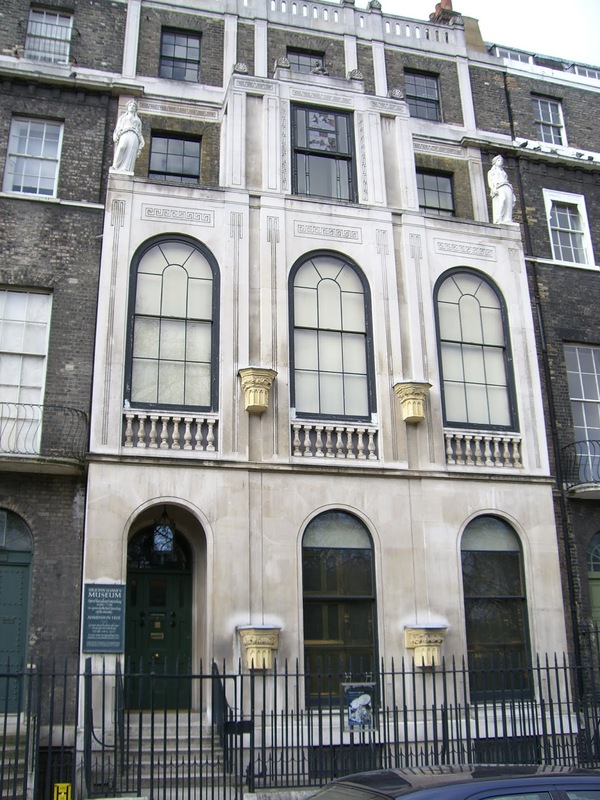 He bought, demolished and rebuilt three adjoining houses in Lincoln's Inn Fields in London. The buildings, joined together, would be not only his home but an office and exhibit space for his many collections. This is a view of the gallery. 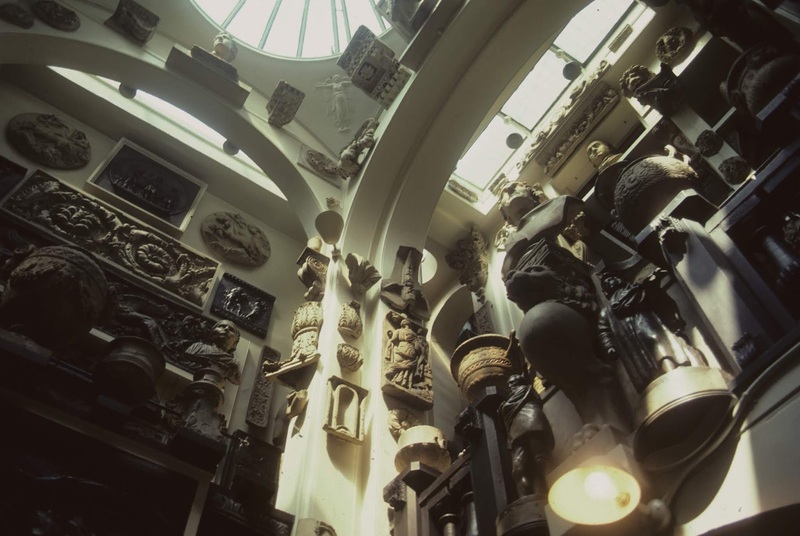 Soane was a serious collector of many things but particularly art and antiquities. He kept expanding the house, rebuilding parts and opening up spaces to give him more room for his displays, eventually opening his home to his students at the Royal Academy to assist in their studies. I wish I could have shown you the sarcophagus of Egyptian king Seti I. It was enormous and housed in the home's crypt. (How many homes do you know with a crypt?) 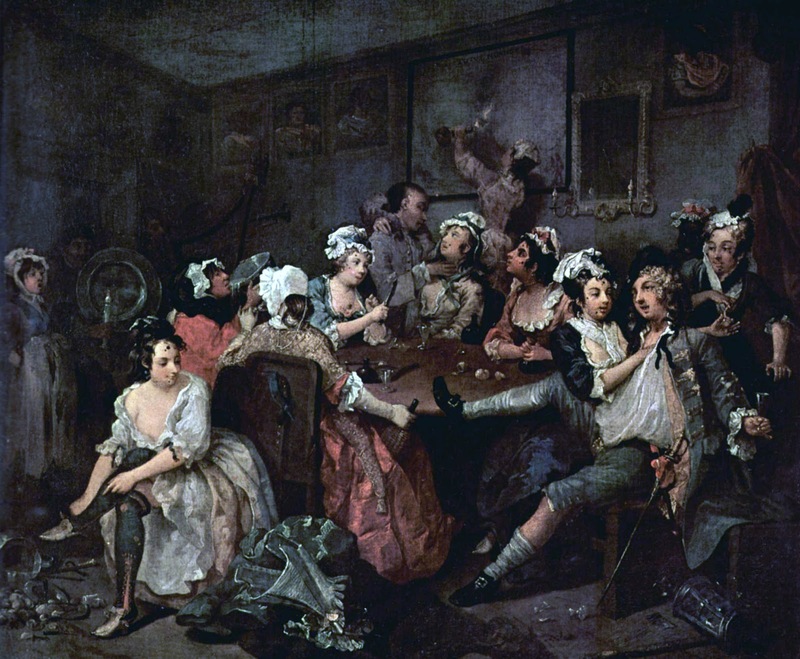 His art collection included works by Turner and Canaletto, among others, and Hogarth's "The Rake's Progress." "The Rake's Progress" is a series of eight paintings that are kept behind a closed panel but opened to guests at a given time. We were lucky to arrive shortly before the opening and it was quite magnificent. But it was also a personal home as well, and the rooms reflect a warmth and charm, despite the size. To be honest, I didn't want to leave his library. The home was his gift to the country, negotiated through an Act of Pariliament in 1933 to preserve the house and collection, exactly as it would be at the time of his death and to keep it open and free. The museum is described in the Oxford Dictionary of Architecture as "one of the most complex, intricate, and ingenious series of interiors ever conceived. And then, a walk back to the tube, a short rest and time for that St. Martin's in the Fields concert I wrote about the other day. A long, good day -- but the next would be our last in this wonderful city. I have enjoyed this trip to London with you! A place I have never been, but now I feel I have almost been there! Hello Jeanie, wonderful photos from your London trip. They bring back memories of my trip there. I remember seeing the changing of the guard. The hotel looks pretty, I like the flags and flowers. Have a happy day and week ahead. I still can't believe how much you were able to pack into your vacation! 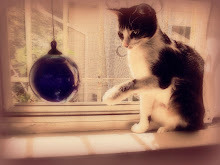 So many wonderful sights and places you've made come alive in your blog! 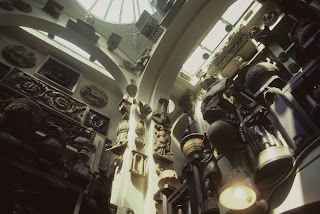 Thanks for these photos and the peek into the Soanes house and its art collections. And imagine visiting Buckingham Palace and arriving in a carriage. Wonderful. Fabulous...so guests invited to Buckingham Palace get to arrive in carriages(? )...how fun is that. We were in London in August when the Queen was on holiday and we got to go into the palace...something definitely worth doing for next time...you are right about the adjoining gift shoppe...wow! What a fun trip! What magnificent places! Being witness to the carriage with it noble occupants will be a memory. I think your London posts have been wonderful. Fantastic to see your photographs and read your write up. The Goring Hotel does look very nice, and yes, the flowers are pretty. That pigeon was strutting just like the guard at the palace. No, I can't imagine a crypt in my house, but that library was very inviting. You and Rick made the most of your time in London. Now, you know I love that library, and it's RED! Just sayin'. And to boot, I'd like an old bike to paint electric pink for my backyard garden. Ha! Green spaces are very necessary for cities. For the most part, my son and his family have lived in high rises in large cities, and they've moved quite a bit. Whenever they moved, the first thing my DIL did was find a park for the kids. So important. Now they live in a place where the kids can go outside without going down 39 floors in an elevator. Your posts have brought back memories of times I spent in London. I think you are like me - seeing and doing as much as you can in the time you have. 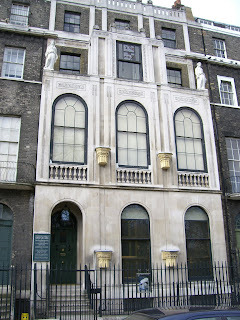 The Soanes House is one I'd like to visit! Jeanie, this is another wonderful London post! I remember being at Buckingham Palace for the changing of the guard. So much pageantry with the royals! I agree with you, I could have stayed in the library for a while. Jeanie, you must have slept well at night! Such an adventure! The Palace looks so elegant. And I've never seen an automobile pooper scooper. Usually just people with shovels and a cart. Fancy! The museum looks fascinating! Thank you for sharing! You certainly did see some wonders places. Guards, changing of the guards, parades, soldiers on horses - are always a great sight. Even in places like Sophia and Athens. I try not to miss these things when I visit a city with a royal palace. It adds some spice to my trip. You really know how to make a place and a trip come to life!!! I've enjoyed all of your chronicles, Jeanie, but London has been a long time dream of mine!! This is as good as the real deal! Great pot. What an iconic place. Everywhere you look, you must wonder, "What historical and non-historical figure walked these streets?" Oh Jeanie, so inspiring! I have enjoyed your London posts. They bring back memories of our trip in 2017 when we stayed at the Goring. Our travel agent arranged everything and we were pleased with how great it was. How cool to find out of the way small museums and gardens. You and Rick planned your time beautifully. I love that pink bike at the end of the post! And it's nice to see green/yellow leaves and blooming flowers on a day when the windchill is -55F. Bleh. You guys really made the most of your time in London!! Wonderful photos Jeanie. And the Queen didn't come out to wave to you :) The parks look lovely and just loved that pink bike and flower cart. Magnificent architecture everywhere and so much beauty. Soane's home is my favorite place so far. Keep warm! Jeanie I would be quite happy staying in Mr. Sloane,s house all day. It looks like it was brimming with art. And you never get tired of looking at that. The park also looks like a great place to while away the hours. Wow you got to see a fairly tale event with the guests arriving at the castle in those coaches! I enjoyed the tour at Sr John Sloane’s house. I’m quite sure you’ve showed us thins that most of us will never see or would have known to go see. Great job! The lions are just beautiful! And I'm all up to date with the British Royals, too, they're on the daily news here in Australia. You sure did not ... ;-) ... get me with that foot break. Oh, sad only one more day is to come! The park bench could be a movie scene..I like the bike too:) LOL you see where my tastes lie..Must admit in Paris..seeing men in uniform..was moving I have no idea why but in groups..it's quite lovely.. So glad you saw and did soo much! Boy have you made tracks! You have made some wonderful memories to hold onto. We just went to see Tea With the Dames at a local theater. So many wonderful things To see and do in London. Another wonderful . . .
in one room, one wall. Kind of like that idea! I found London to have its charm where ever I visited. I have totally enjoyed each of your posts . . .
And I want a bicycle and basket cart just like that! and short sleeves instead of ten pounds of sweaters and wool! Stay warm and safe Jeanie! Thank you for the visit . . . 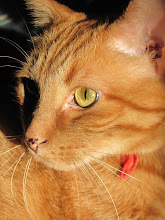 Wonderful post!Thanks for this virtual tour!Hugs. I wouldn't want to leave this library either. What a very special time you had on this adventure. Fascinating to be at the palace when dignitaries arrived in the carriage. Yes, the flowers on the building are really pretty with the greenery too. I'm glad you got to see Soanes museum. I am surprised they don't allow pictures, maybe that is new. I could say though that it is none too easy to take photographs, something about the layout, and so postcards are probably the least trouble! What a nice day you had.